● Special Summon 1 “Dark Magician” from your hand or Graveyard. ● Add 1 “Dark Magic Attack” or “Thousand Knives” from your Deck to your hand. Some cards you remember for a long time, even if you never play them. I have an OCG Volume 3 Gaia the Dragon Champion in my collection – the first secret rare ever made. I remember being awed by the chaos monsters and disgusted by Magical Scientist. And I’ll never be able to forget Eternal Soul. Released almost three years ago, the trap became the sign that Dark Magician was going to make a real comeback and finally become useful. Fast-forward to the present day, and this is still one seriously great card. And it’s because Eternal Soul is so unique that it’s memorable. With the ability to absolutely protect Dark Magician while also allowing for potential limitless plusses, no other card quite compares to Eternal Soul, which is appropriate for a monster of Dark Magician’s legend. But obviously, the inherent weakness of Eternal Soul also led to Dark Magician not quite reaching the heights Blue-Eyes White Dragon reached. Destroying all your monsters through one Twin Twisters is pretty brutal. Even so, this is a must run, and with the new potential of a combo with Dark Magician the Dragon Knight, Eternal Soul has a chance to truly dominate the game, perhaps not now with SPYRAL’s absolutely crushing the meta, but maybe soon. Konami is committed to providing periodic new support to the Dark Magician, and that’s probably not changing any time soon. And Eternal Soul will absolutely always be part of any future Dark Magician deck. My current recommendation is running one Dark Magic Attack and zero Thousand Knives. Dark Magician’s true weakness is that his deck is full of cards that rely on other cards to be useful. If you think about it, it’s a concept pretty much exclusive to Dark Magician: a full gamut of ridiculously powerful cards that are only hindered by their reliance on other cards. Eternal Soul is no exception, but that’s no excuse not to run three copies of this amazing trap. Eternal Soul is the ultimate protection card for Dark Magician. Special Summon a DM from the hand or grave during either players turn, or search out a DM ATK or Thousand Knives. EVERY TURN, every turn you can do this. You are more likely to be Special Summoning a Dark Magician every turn, and when Dark Magical Circle is on the field, this means a lot. Banishing a card each turn can really put your opponent in a bind. A Dark Magician every turn can mean easy material for Link Summons, which lead to Xyz and Fusion Summons. Regardless, Eternal Soul doesn’t attach, so you can summon multiple Dark Magicians with it. Then comes the protection. Dark Magician is unaffected by all opponent card effects while this is on the field. When you combo this with a card we reviewed earlier in the week (Dark Magician the Dragon Knight), the opponent is between a rock and a hard place. Eternal Soul will wipe your whole field clean of monsters if it leaves the field, so protecting it is a must, or play conservative. Great card for the archetype, great protection and search during each players turn, but the field-wipe ability can be devastating. Eternal Soul gives you free Dark Magicians. It’s a Continuous Trap Card that not only protects Dark Magician from all opponent’s effects of cards, but once per turn you can Special Summon Dark Magician from your hand or grave. The only downside is that if it leaves the field, Eternal Soul wipes your side of the field of monsters. Too good not to run. I hope Dark Magician decks become as popular as Blue-Eyes decks. That tournament finals would be awesome. Score: 4.25/5 Art: 4.5/5 Throwbacks are awesome. Today, we look at a key part of the Dark Magician deck, Eternal Soul. 1. Special Summon a Dark Magician from the hand of GY. 2. Add a Dark Magic Attack or Thousand Knives from the deck to the hard. The first effect is great for doing what the Dark Magician deck should be doing, summoning Dark Magician. This is better if comboed with Dark Magical Circle. Also, having the ability to get removal when needed is phenomenal. Most play Dark Magic Attack only and not Thousand Knives though because Thousand Knives isn’t really needed when you got a 2500 ATK monster, so it can likely run over whatever monster you would want to pop with Thousand Knives. 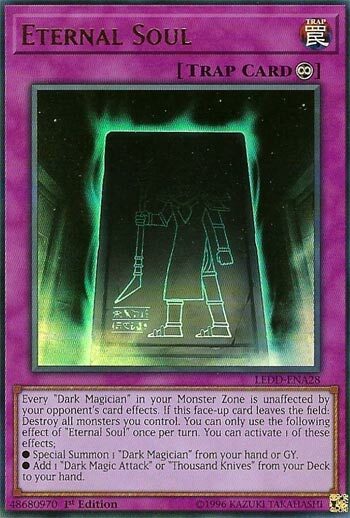 Plus, Dark Magic Attack is basically Harpie’s Feather Duster, just requiring you controlling Dark Magician. Long story short, this is a key piece to the Dark Magician deck and strategy. Play 3 of these in Dark Magician Decks. This card combos well with a LOT of cards, and is powerful itself. Namely, for one, with Monday’s card. Being able to protect this card is key, so it doesn’t turn on you and destroy all your Monsters on the Field. Every Dark Magician you control in your Monster Zones is protected from your opponent’s card effects. Furthermore, this card makes summoning Dark Magician even easier. This card has two effects, and you’re allowed to use one, once a turn. First, you can Special Summon DM from your Hand OR Graveyard, which is incredibly awesome. Or two, add a Dark Magic attack or Thousand Knives to your Hand from your Deck. Dark Magic Attack (for any uniformed) is a Harpie’s Feather Duster so long as you have DM on the Field. Thousand Knives very likely isn’t anything the player is using, but it’s still something to fetch if necessary. Like yesterday, you play DM in whatever form, you play this. In multiples. Next articlePokemon Card Grading – Should You Get Yours Graded?